– 2 x packets, crushed tennis biscuits. – 200g x melted margarine. – 4 x 125g tubs of cream cheese. – Icing sugar to taste. – 500g x milk chocolate. – 1 x tbsp. cooking oil. – Mix the crushed biscuits with the melted margarine till well combined. – Grease a springform tin and gently press the biscuit mixture on the bottom of the tin, nice and firmly. Set aside in the mean time. – In a bowl mix the cream cheese and icing sugar together and set aside. – Melt 400g of the dark chocolate. 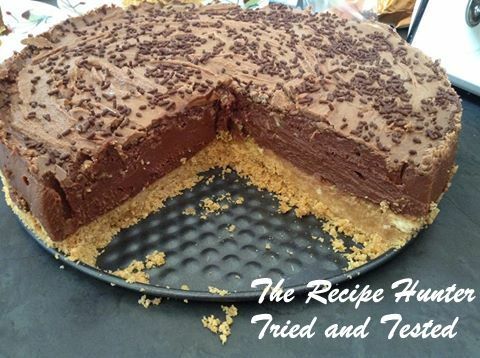 – Add a little bit of cream cheese mixture to the chocolate mixture at a time. – Mix well until everything is well combined. – Once the mixture is well combined pour it over the biscuit base and press down so that all the air bubbles are removed. – Place in the fridge for 20 minutes. – In the mean time, melt the other 100g of milk chocolate. – Once melted add a the cooking oil and set aside. – After the 20 minutes remove the cake from the fridge and pour the melted chocolate over, I added chocolate sprinkles over mine before I popped it back into the fridge to set overnight.